Eco-friendly Ganesha – Don’t immerse, just plant it! Let’s step up and celebrate an eco-friendly Ganesha chaturthi this year! In the past few months, our team has been working tirelessly with the community, volunteers, and government officials to save the lakes of Hyderabad one lake at a time. If you have been following our Facebook page, you can see the progress we are making each day. While we focussed our efforts on restoring lakes and the ecosystem around them, we also want to work on prevent further damage to the lakes. And that’s why the upcoming Ganesha festival is cause for rejoicing and worry too. Today, more and more communities are coming together to put up big and colourful Ganesha idols. Competitions for the most elaborate pandals are only increasing the magnitude of celebrations across the city. Unfortunately, after ten days of extravagant celebration of welcoming, worshipping and bidding farewell to the beloved elephant-headed Ganesha, the lakes in the city resemble the shambles of a battle field. Thousands of idols of Lord Ganesha decay in a sludge of flowers, incense, fruits, coconuts, leaves, stones, clay, jute, bamboo, clothes and food, with a cloud of mosquitoes and flies swarming above it. For example, In 2016, the level of pollution levels in the iconic Hussain sagar Lake reached monstrous proportions. About 50,000 idols were immersed during Ganesh Chaturthi. Most of the idols were made of Plaster of Paris (PoP) and painted with metallic paints containing heavy metals. These metals seep up to three metres into the lakebed thereby poisoning aquatic life. Last year, post immersion, the pH value in Hussain sagar lake shot to 9 (normal range is between 7.4 and 7.9), turbidity or cloudiness of water in the lake, shot to 72 (normal is between 17 to 48), total dissolved solids shot up to 1,126 (normal is 652), dissolved oxygen between 3 and 7.2 (normal range is between 8.5 to 5.2), and chemical oxygen demand (COD) went up to 289 (from 249). In effect, this lake is unfit for human use, and will cause severe health issues for animals and birds. While the above data is from Hyderabad’s biggest water body, the status of other water bodies is sometimes the same or worse. Can we afford to continue doing this to our water bodies? 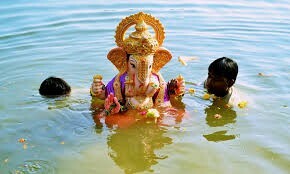 What can we all do to celebrate Ganesh Chaturthi without harming environment so much? Well, to start with, you can make the choice of buying an eco-friendly Ganesha that doesn’t contain these harmful substances. Better still, you can buy an idol that will have a positive in the future too. And that’s exactly what the Plant a Ganesha idol will allow you to do. Brought to you by Live the Lakes initiative of SAHE, this clay Ganesha comes with a small sapling. That’s not all… You can enjoy more as a family by adding the sapling pockets behind the clay Ganesha or even attach a pot sliced in half to the Ganesha with fresh clay or M seal as a do-it-yourself project. We are sure this activity will be more fulfilling as a family! 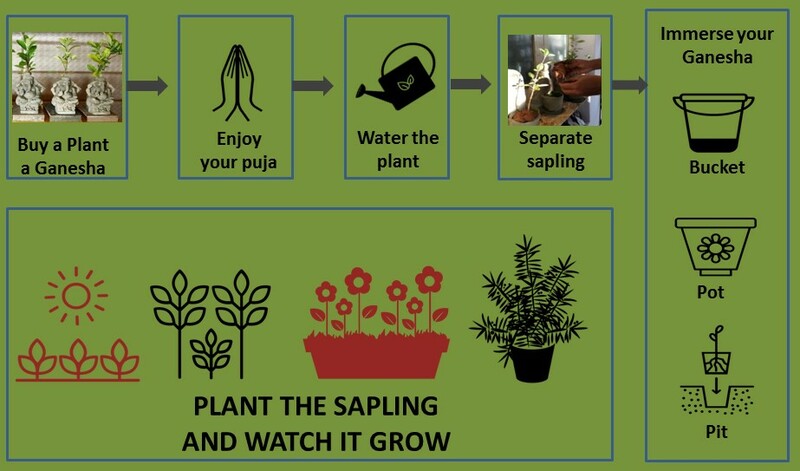 Don’t just pray to Ganesha, Plant a Ganesha this year! !